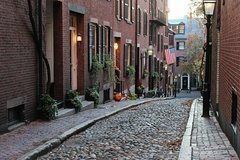 Covering two of Boston's most historic neighborhoods, this two-in-one-tour is jam-packed with winners! We'll begin with a three-course light lunch at the restaurant of a legendary James Beard Award winner, and will end at the award-winning fine dining restaurant with an elegant dessert. In between we'll visit two multiple award-winning specialty shops - roasted nuts and chocolates - and will enjoy a savory tasting at a bakery which has been rated as high as the third best in the country! (And as we learned, Bobby Flay has *nothing* on it!). Add an off-the-beaten-path wine and cheese shop, and sightseeing through exclusive Louisburg Square (the home of John Kerry), Boston's most-photographed street, and the oldest botanical garden in the country, and you're assured of a wonderful day filled with delicious memories. Join us as we Stroll. Sample. Savor. Repeat. Note: Tour stops subject to change. Tour generally starts at 1:30 p.m. and concludes by 5:45 p.m. Group meets in front of the second floor concierge desk at the Liberty Hotel, which is centrally located across the street from the Red Line's MGH/Charles Street train station. Valet parking is available at the hotel. Guests also have access to a local parking lot and parking garages. Guests must be capable of climbing one hill, and of walking up to two miles. Cost covers all food, taxes, and servers' gratuities. Drinks, for which we're happy to start a tab, or tour guide's gratuity, if guests wish to consider are extra. We defer to parents' judgment as to whether tour is appropriate for children. Two-years-old and under are free of charge.